Like Earth, Mars has an atmosphere and weather, but both differ greatly from what we experience on Earth. Let's compare: The composition of the Martian atmosphere differs greatly from Earth's. Earth's atmosphere is 78% nitrogen, 21% oxygen, 1.0% argon, 0.04% carbon dioxide, and small amounts of other gases. It also averages about 1% water vapor. Mars' atmosphere however is 95% carbon dioxide, 3% nitrogen, 1.6% argon, and it has traces of oxygen, carbon monoxide, water, methane, and other gases, along with a lot of dust. Dust hanging in the air colors Martian skies tan in photos taken from the surface. Relative to Earth, the air on Mars is extremely thin. Standard sea-level air pressure on Earth is 1,013 millibars. On Mars the surface pressure varies through the year, but it averages 6 to 7 millibars. That's less than one percent of sea level pressure here. To experience that pressure on Earth, you would need to go to an altitude of about 45 kilometers (28 miles). (Yes, you'll need a space suit to walk around on Mars.) The Martian surface pressure also varies due to elevation. For example, the lowest place on Mars lies in the Hellas impact basin, 7.2 km (4.4 mi) below "sea level." The pressure there averages about 14 millibars. But on top of Olympus Mons, 22 km (14 mi) high, the pressure is only 0.7 millibar. Earth’s atmospheric pressure varies with altitude as well, but Mars has a seasonal variation in pressure that does not occur here on Earth. It happens on Mars because the amount of CO2 gas in the atmosphere changes with the seasons. The Highest pressures occur during the southern summer months and the lowest pressures occur in northern summer months. What drives this change are different temperatures during northern and southern polar winters. Northern polar winters are relatively warm and short; the southern ones are long and severe. The deep cold southern polar winter removes CO2 gas from the atmosphere by freezing it directly onto the south polar cap. As temperatures drop below –123° Celsius (–189° Fahrenheit), CO2 freezes out as frost, snow, or ice. This causes air pressure all over Mars to drop by 25% to 30%. Another way to understand this is that atmospheric pressure changes as the top layer of one polar cap migrates to the opposite polar cap in the form of air — and then migrates back half a Mars year later. The circulation of Mars' atmosphere is simpler than Earth's, mostly because it has no oceans. At low latitudes, Hadley cell motion dominates. Named for English scientists George Hadley (1685-1768), who first described it on Earth, the pattern features rising, heated air around the equator. One part of the warmed air flows northward (and one part southward) to about 30° latitude (north and south), where it cools, sinks, and then flows back toward the equator at the surface. The flow is prevented from moving directly north-south by the planet's rotation and the surface landforms, which direct the flow locally. In the northern hemisphere these surface winds blow generally from the northeast and in the southern, from the southeast. At higher latitudes, polar air masses dominate and a series of high and low pressure areas sweep around the planet from west to east. Where these interact with Hadley cell movements, sharp weather fronts and even storms can arise. Martian frontal storms, however, tend to be less violent than terrestrial ones because the atmosphere is much thinner, temperatures are lower, and water vapor — which carries a lot of energy — is very minimal. Mars has no ozone layer in its atmosphere as Earth does. This means ultraviolet radiation from the Sun and astronomical sources reaches the surface unhindered. This radiation is harmful for any exposed organic compounds. The lack of an ozone layer also means that the Martian atmosphere has no warm layer corresponding to Earth's stratosphere. 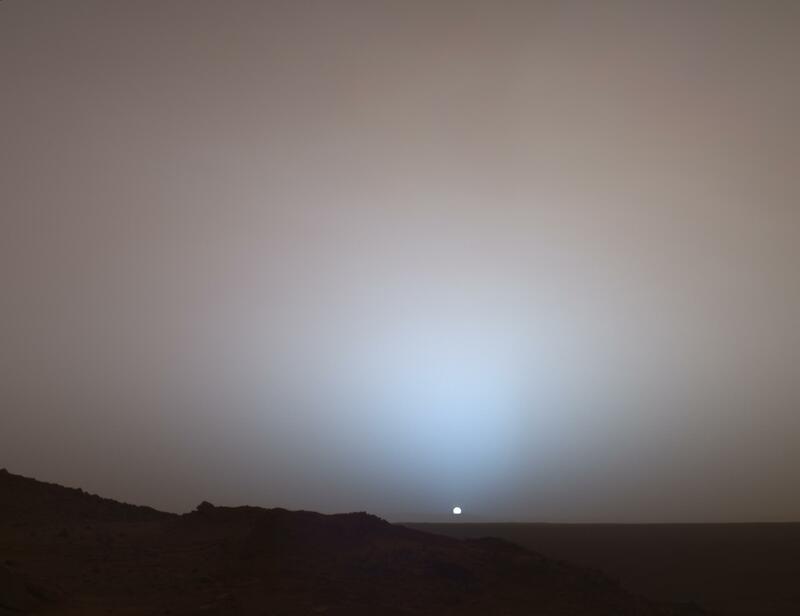 In addition to dust storms, Mars has clouds made of both water ice and CO2 ice particles. Scientists have studied these from orbit with spacecraft, from the ground with rovers and landers, and from Earth with big telescopes. Clouds collect near the large volcanoes as winds rise over them and ice particles condense. In winter, clouds also form over the polar regions as broad hazes that scientists call polar hoods. The Phoenix lander, which touched down at latitude 68° north, detected CO2 snow falling from clouds passing overhead. The snow sublimated before reaching the ground. Other landers and rovers have detected water-ice frost on the ground on cold mornings. The frost disappears quickly after the Sun rises.